Nothing gets paint cleaner than clay! 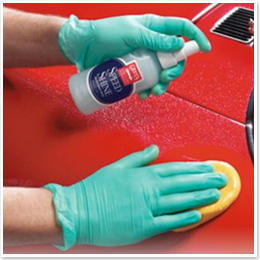 Now you can deep clean the paint in a fraction of the time with Griot's Paint Cleaning Clay. Remove embedded brake dust, rail dust, and other environmental contaminants without abrasives. The paint is left squeaky clean and ready for a coat of wax. Griot's Garage Paint Cleaning Clay is safe on all paints and glass. Regardless of how clean you think your paint is, there are still contaminants stuck on the paint that you need to remove before waxing or polishing your paint. If these contaminants are not removed, they can interfere with the bonding of the wax and leave the finish looking patchy and uneven. 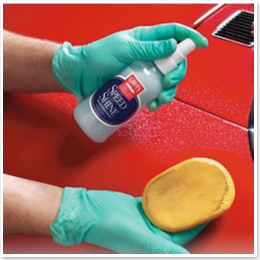 Paint Cleaning Clay leaves behind an ultra-smooth surface that will make your wax adhere better and last longer, too. It also makes the wax much easier to buff out, reducing your "elbow grease" substantially. Griot's Garage Paint Cleaning Clay is safe for all paint and also works great on glass to remove films and grit. The best part is that Griot's Garage Paint Cleaning Clay contains no abrasives. The old way of getting paint smooth and clean was to polish with an abrasive polish. Griot's Garage Paint Cleaning Clay cleans the paint without abrasives, so there's no leveling or cutting of the paint. The paint will feel incredibly slick and smooth. Griot's Garage Paint Cleaning Clay is an elastic, highly workable detailing clay. The 8 ounce clay bar cleans about 7 vehicles, depending on the amount of contamination on the vehicle. Very important: Always use Griot's Garage Speed Shine as a lubricant with Griot's Garage Paint Cleaning Clay to protect the vehicle and keep the clay from sticking to the paint. It also helps the detailing clay glide across the paint faster. Use Griot's Garage Speed Shine to lubricate the paint when using Griot's Garage Paint Cleaning Clay. Griot's Garage Paint Cleaning Clay removes embedded grime from paint and glass. To use, just remove the clay from the wrapper, spray the paint's surface with Griot's Garage Speed Shine® (acts as a lubricating fluid), and rub the clay back and forth until there is no drag. Occasionally fold the clay into itself and reflatten to have a clean area of clay surface. Once the clay glides without drag, the paint is clean. Unlike other cleaners and polishes, no buffing or hard circular motions are necessary. Claying takes literally one fourth the time as using paint cleaner! Follow up with Griot's Garage Best of Show Wax® and your paint will look stunning! Try Griots Garage Paint Cleaning Clay and you'll be hooked. The results are amazing! I have not used this particular clay as of yet. I gave it five stars because of its large size as compared to other clay bars. This clay bar works very well with using the speed and shine with the clay bar. I've been using Griot's clay for some time and find it a true value in the world of clay bars. For the price of admission, you get 8 ounces of clay - which is a decent value when you consider you do not need much to effectively clay bar a vehicle. When used properly it is a effective first step to acing the "baggy" test. Pros- Sticky, but that's part of it's appeal - it picks up and grabs everything it comes into contact with - The yellow color offers good visual evidence of what you removed from the paint - Leaves the paint very smooth, and should be considered a prerequisite prior to paint correction - Container is air tight allowing for storage of the clay without fear of drying out. For hobbyist detailers, one container could conceivable last you several years. Cons- I find it's stickiness calls for more detail lubrication than other clay bars. Not a big deal really, because there are so many effective lubricants can be waterless/rinseless solutions you mix up yourself with concentrate solutions. - Wear gloves when using. Feels like Play Dough in warm, humid conditions - and will stick to your hands. Does not harm, and easily prevented with gloves. I've been claying my cars for more than 10 years. Best detailing secret I ever learned! But I've found that many clays that I have tried including those from Adams, Detailer's Domain [two different recipes], and Mother's are generally much harder and harder to knead and use than Griott's Garage yellow clay. Until I tried several others, I did not realize the significant differences among them. The clays from Adams and Detailer's Domain were so hard, even after pre-warming them in hot water, that I had very sore forearm muscles for a few days after struggling to use them. [They might be good products for body builders wanting to increase their grip muscles!] The Griott's clay is stickier than the others, too. And the yellow color makes it very easy to see the contaminants that are removed from painted panels or painted wheels. ProsEasy to knead and use, easy to see contaminants that are removed. Price is reasonable compared to competition. Screw-on lid storage container and sealed plastic film packaging within keeps new clay fresh and soft. I have a used remnant of a several years old bar that I keep in its original container and it is still soft. Not so with the competition. ConsSticky enough that use with thin rubber gloves is advised. Otherwise, some of the clay is likely to transfer to your skin. I love this clay. My second batch I've ordered. Glides well, picks up a lot, easy to kneed. ProsWorks well on general paint cleaning. Haven't had to use it on the hard to get clean things though. Have nanoskin for that.